JACOB LAKE, Ariz. — The Coconino County Sheriff’s Office received report of a missing 5-year-old boy Thursday at approximately 5:30 p.m. at an unimproved campsite located approximately 12 miles south of Jacob Lake in the area of Highway 67 off of Forest Service Road 241. This area lies within the northern portion of the Kaibab National Forest not far from the North Rim of the Grand Canyon. Coconino County Sheriff’s Deputies were immediately dispatched to the campsite. Upon their arrival they spoke with the missing child’s mother who identified her son as Jerold Joseph Williams. According to Mrs. Williams, she and her son were with 15 to 20 other friends and family members who were camping in the area. At approximately 1:30 p.m. MDT, Jerold and his mother were approximately 100-200 yards from the campsite, and Jerold was chasing grasshoppers. Mrs. Williams lost sight of the child and for the following four hours, members of the camping group searched for him. At approximately 5:30 p.m. MDT, the decision was made to call the Sheriff’s Office. Clothing: gray/tan shirt (size 4), blue jeans (size 4), hiking boots (size 12), white long-handled underwear. Individuals assisting with this search operation include Coconino County Sheriff’s deputies, two Coconino County Sheriff’s Search and Rescue ground search teams, Arizona Highway Patrol officers, Arizona Game and Fish Law Enforcement officers, U.S. Forest Service fire crews, two search helicopters equipped with night vision equipment from the Nellis U.S. Air Force Base, the Bureau of Land Management and two search dogs and their handlers who are also members of the Coconino County Sheriff’s Search and Rescue Unit. During the nighttime hours, the area where Jerold was believed to be missing from was searched by responders on foot and in vehicles driving on dirt roads. Friday morning, air operations were suspended due to weather conditions, Arizona Department of Public Safety Sgt. John T. Bottoms said, noting that all agencies involved worked through the night in the search. 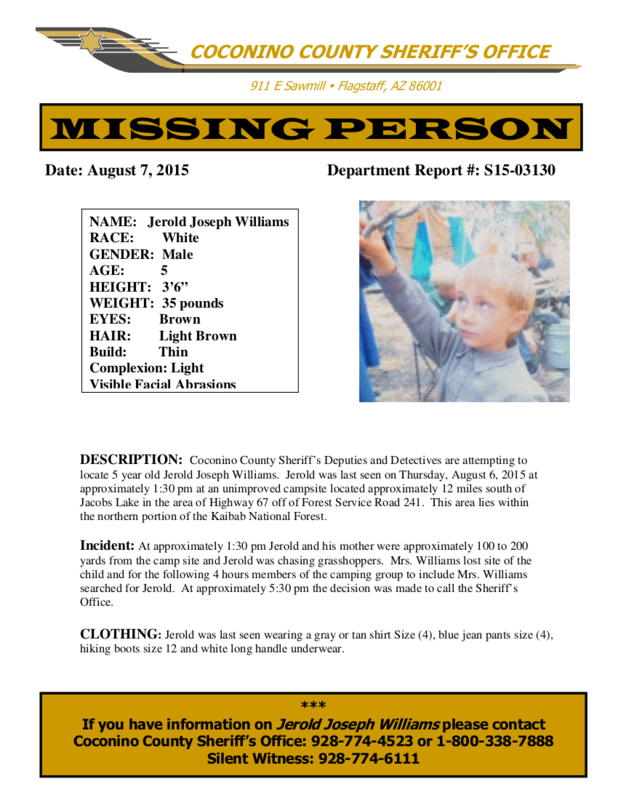 Anyone with information regarding the possible location of Jerold Williams or the circumstances leading up to his disappearance is urged to call the Coconino County Sheriff’s Office at 928-774-4523. UPDATE: Those interested in assisting with the search should call 928-226-5012. If calling after hours, leave a message with your name, phone number and any resources or services you wish to contribute to the search. Ed. note: The area named as “Jacobs Lake” in the release should be Jacob Lake, a recreation area 44 miles north of Grand Canyon National Park’s North Rim. Correction made to headline and story. Wow… Not good. I pray they find him very soon and in good condition. Thoughts and prayers to his family as well. Oh my! This is terrible! As I sit on my porch and the rain is coming down hard, I think of this 5yr old alone, in the rain, and hungry….my prayer is they find him alive soon! I really hope they find this sweet little boy, and all is well with him! It breaks my heart hearing this. David Paulides books: Missing 411. Lots of people go missing in our National and State parks every year. This makes 2 little boys in 2 months that I have seen.